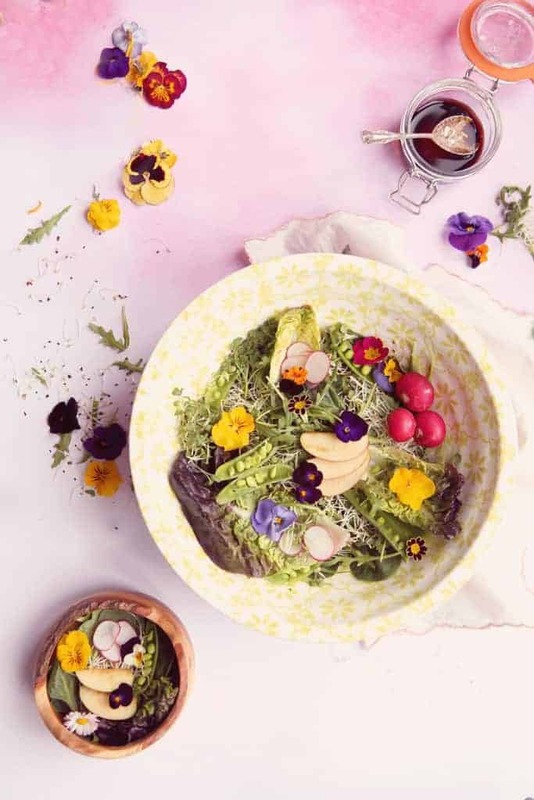 Edible flowers spring salad – this simple recipe will delight your guests and brighten up your dinner table. Learn which flowers are safe to eat, where to source them and what to do with any leftover flowers so they don’t go to waste. A little over two years ago I started taking a real interest in edible flowers and I’ve been using them to embellish a variety of recipes ever since. As a food enthusiast, I like to present my guests with a dish that not only tastes great but looks beautiful. And as a photographer, nothing delights me more than devising a recipe that includes edible flowers. I could photograph them all day and never get bored. They make all types of food look glorious and really takes them up a notch in terms of presentation. People eat with their eyes first, after all. Quite often the edible flowers will be pushed aside, untouched. But once in a while my guests will indulge and be surprised at the flavour of the flowers, and once they’ve tasted them they’re hooked. What dishes can I make with edible flowers? Well, the answer to that is pretty much any dish! Edible flowers come in a variety of flavours from delicate to spicy. Sweet little violas look pretty adorning a pastel coloured cake but if you ask me, there’s nothing more beautiful than a fresh green spring salad topped with edible flowers. As with all my fruit and vegetables, I buy local from the greengrocer this ensures I get the freshest in-season ingredients. They taste better, there’s less packaging and it’s often cheaper than the supermarket too. I tossed together a variety of salad leaves with alfalfa and cress. I added crunchy radishes, apple and fresh peas in the pod for extra colour and drizzled over my go-to super simple balsamic dressing. The salad was then topped with the prettiest and sweetest blooms. And the finished result looked very spring-like and *almost* too good to eat. Which flowers can I eat? Below is a list of some of my favourite edible flowers, although there are many varieties I haven’t tried yet. It is possible to grow your own edible flowers at home, you might even have a few in your garden already. Just make sure you check they’re actually edible before you nibble on them! 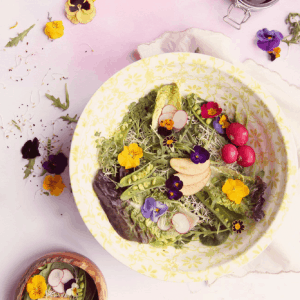 Flowers in bold were used in this salad. Where can I buy edible flowers? I order all of my edible flowers online from Maddocks Farm Organics, I usually buy a box of mixed seasonal flowers and always ask for extra violas in dark purple (because they are my absolute favourites!) They arrive cold packed and in pristine condition, I’ve never been disappointed in the variety. They’re not cheap but there are around 100 flowers in a box so I get lots of use from them. You could also try a farmers’ market, your garden, your neighbour’s garden, or spend some time foraging. Avoid anywhere that sells flowers treated with pesticides or chemicals: so no garden centres, nurseries, florists or supermarkets. The golden rule is to know the provenance of the flowers and do not eat anything you’re not 100% certain about. 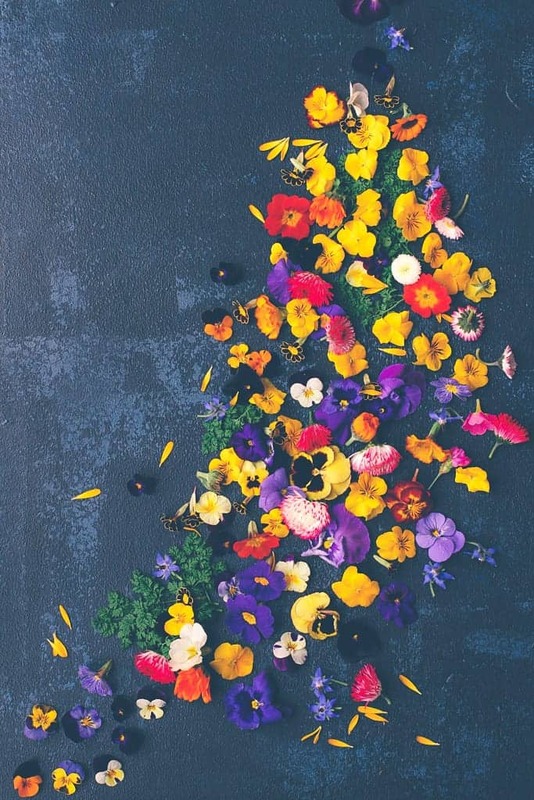 What can I do with leftover edible flowers? Freeze them! Once you’ve delighted your guests with the main event, turn the flowers you didn’t use into beautiful edible flower ice cubes. Perfect for summer garden party cocktails; watch the petals unfurl as the ice melts. You can see my flower ice cubes here but it’s really as simple as popping them in an ice cube tray, pouring water over the top and freezing them. 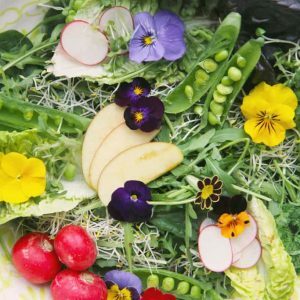 A spring edible flower salad recipe with balsamic dressing - guaranteed to brighten up your dinner table. 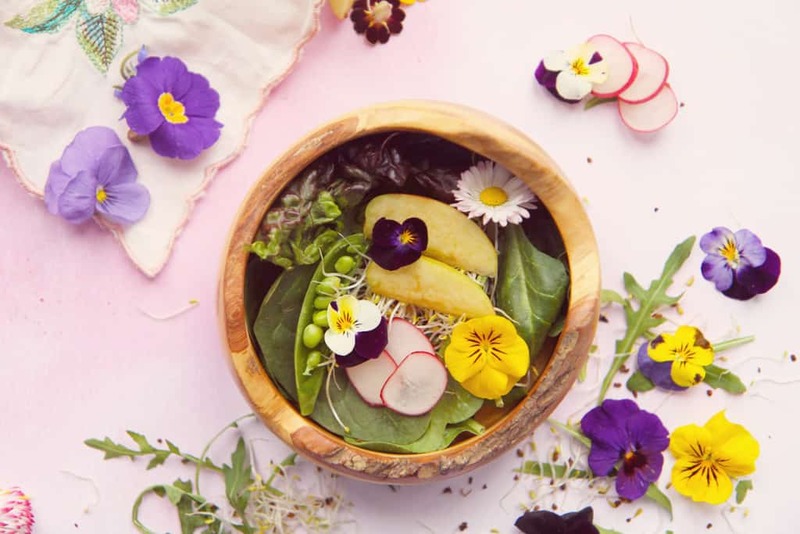 Assemble the salad by adding the salad leaves to a large bowl, top with the remaining ingredients and add the edible flowers for a final flourish. Put 6 tablespoons of extra virgin olive oil and 2 tablespoons of balsamic vinegar into a jar with a pinch of sea salt and freshly ground black pepper. Put the lid on the jar and shake well. Avoid soggy salad leaves by serving the balsamic dressing separately. Instead, ask guests to help themselves once the salad has been plated up! Please don’t forget to share this recipe if you enjoyed it and for more ideas check out my other recipes featuring edible flowers. 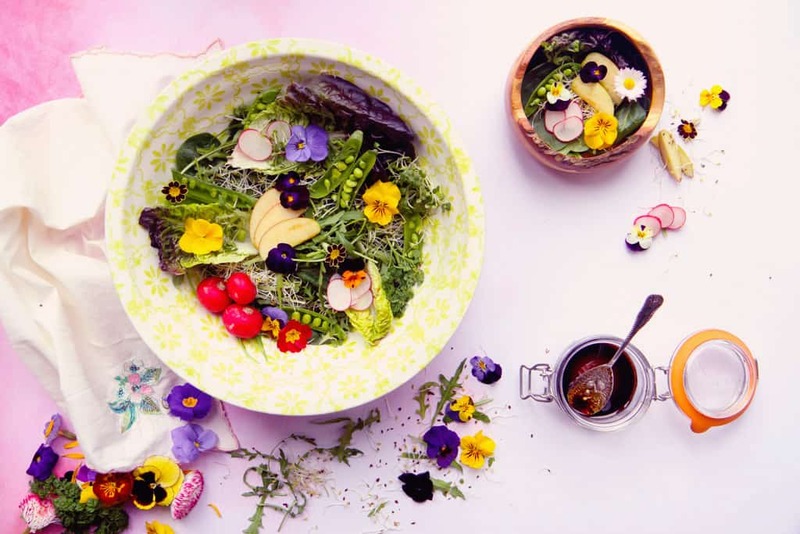 Will you be trying this recipe or are flowers too pretty to eat? Edible flowers make such a great presentation. I think my favorite is nasturtium. I love that peppery flavor. They make any dish look so pretty!